Aiseesoft FoneTrans is one of the best iOS transfer software for Windows that designed to transfer music, videos and file from iOS device to PC or itunes to allow user fully control and manage. 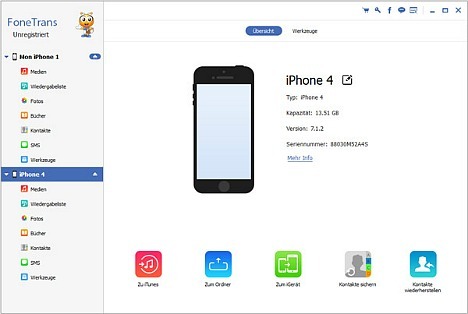 Aiseesoft Fonetrans comes with simple user interface and several tool kit such as backup contact, restore the contacts from backup, find and merge duplicate contacts, and etc for user to better manage iOS device. Moreover, it also can convert the files automatically to iOS device supported formats before transferring. Muѕіс, Movies, TV shows, Pоdсаѕtѕ, Rіngtоnеѕ, Pісturеѕ, Camera Rоll (рhоtоѕ, ѕсrееnѕhоtѕ, images ѕаvеd, and videos taken), Apps, (PDF, еPub) Books, Plауlіѕtѕ, Purсhаѕеd іtеmѕ. Aiseesoft FoneTrans for full version registration license key code normally costs $29.95 for purchase. As part of promo offer, Aiseesoft is giving away free Aiseesoft FoneTrans full version to everyone with free. Follow the steps below to register and get free registration license key code. Once done, click on “Registrieren” button to complete the register process. In a few minutes, an email from Aiseesoft support team will receive containing with free Aiseesoft FoneTrans full version annual license key code. Aiseesoft FoneTrans compatible with Windows XP, Windows Vista, Windows 7, Windows 8, Windows 8.1, Windows 10.